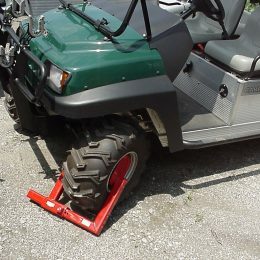 Skidsteer Lock I Patent # 6,173,590 Filed Jan 27, 2000 Lock both drive controls of all skid loaders. Skidsteer Lock II Patent # 6,553,797 Filed Feb 5, 2002 Lock both drive controls of all skid loaders. E-Series Skidsteer Lock Patent # 6,539,757 Filed Feb 5, 2002 Lock one drive control of all skid loaders. Backhoe Lock Patent # 6,519,983 Filed Feb 5, 2002 Locks the forward/reverse drive control and the steering wheel in the turned position. Attachment Lock Patent # 6,990,838 Filed March 11, 2003 Lock the attachment locking arms in the down position. Excavator Lock Patent # 6,705,135 Filed March 11, 2003 Lock both track drive controls in opposite directions. Ball and Ring Hitch Lock Patent # 6,698,256 Filed March 11, 2003 Locks any size ball (1-7/8”, 2”, 2-5/16”) or ring/pintle-type hitch. 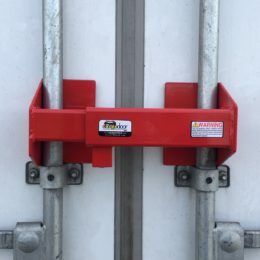 Cargo Door Lock Patent # 7,278,663 Filed November 12, 2004 (Standard and Heavy Duty + changeable combination lock claims) Lock the double swing doors of all sea containers and semi-trailers. Stabilizer Lock Patent # 7,337,636 Filed March 29, 2006 Locks the stabilizer or outrigger in the down position with a wheel off of the ground. Hide A Hitch Patent #7,815,211 Filed March 29, 2007 Store and lock a trailer coupler out of the way beneath the bumper. 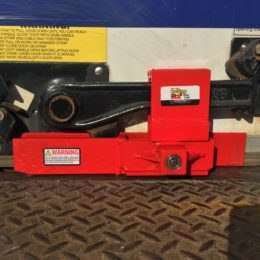 Rolling Door Locks (Standard and Heavy Duty) Patent allowed, to be issued spring of 2019. Filed July 11, 2016 Secure the locking handle of all roll-up doors in the down position. Landing Gear Leg Lock: Patent allowed, to be issued spring of 2019. Filed July 11, 2017 Secure the hand crank so the landing gear cannot be raised.